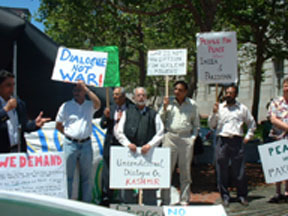 San Francisco: A peace rally was held on June 10 at the United Nations Plaza in downtown San Francisco to express concern over the military standoff between Pakistan and India that could lead to a catastrophic nuclear confrontation. The rally, jointly sponsored by Pakistani, South Asian and American organizations and peace groups, called for according the right of self-determination to the people of Kashmir. Ms. Leila Soraya Salazar, Grassroots Organizer and master of ceremony, expressed concern over the deteriorating situation between Pakistan and India. She said, “We are against war, we want peace.” Ms. Zalazar thanked Mr. Inam Chaudhry, President of Kashmir Foundation, for initiating the rally to highlight the concern of the peace activists. Mr. Chaudhry, in his brief speech, observed that the United Nations resolutions should be implemented and Kashmiris should be given the right of self-determination. The speakers at the rally stressed that the governments of both India and Pakistan must abandon the path of war and settle their disputes in accordance with the dictates of international law, in particular, UN Security Council Resolutions of 1948 which give the people of Kashmir the final right to decide their own destiny. The rally was organized by Pakistan American Democratic Forum, Pakistan Association of San Francisco, Kashmir Foundation, Friends of South Asia, California Peace Action, People’s Nonviolent Response Coalition, Coalition against Communalism and Global Exchange. 1. That the Indian and Pakistani governments work towards peace and not war. The people of India and Pakistan want peace and we demand that their governments not use war as a political weapon. 2. An end to ALL violence, including violent rhetoric and threats of war. We condemn all war, particularly nuclear war. 3. That Pakistan and India devote their resources to human needs and to ending social injustices, not on armaments and military expansion. 4. A de-escalation of the military build-up and war rhetoric. 5. A constructive and open dialogue between peoples and governments. Governments should resume political and diplomatic negotiations immediately and re-open communication lines between the peoples of India, Pakistan and Kashmir. 6. The people of Kashmir have the right to self-determination. 7. No US military intervention. The US should lead by example by immediately declaring a policy of no first use of nuclear weapons and initiating multilateral negotiations on the rapid elimination of nuclear weapons worldwide.